The first handset to run the new BlackBerry 10 mobile platform will not sport Research in Motion's famous physical QWERTY keyboard. The Washington Post reports RIM spokeswomen Rebecca Freiburger confirming the first BB10 handset will feature a touchscreen keyboard only. RIM is very proud of its new keyboard touvh technology which it has developed for the BB10 platform. Vivek Bhardwajk, Head of Software Portfolio at RIM, told TechRadar "we want to nail the keyboard experience, whether it's physical or all-touch keyboards." RIM has developed a new form of next word prediction, which sees suggestions appear above related characters on the keyboard, instead of in a bar above it – which allows for faster input and easier one-handed typing. 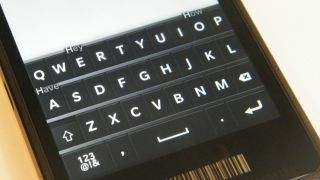 Early signs show this new touch-screen keyboard is a vast improvement on RIM's previous attempts, such as the poor offering found on the BlackBerry Torch. RIM is staying coy on when the first BB10 handset will make it to market, but Bhardwajk hope something will arrive before the year is out.